There is a simple guaranteed statement I will assert specific to the safety and effectiveness of a foam rolling routine, that foam rolling is both safe and extremely effective. When I come across those that are uneducated in the foam rolling arts, it is apparent that certain blogs and journal publications like to smear anything that is good for you health. I must assume that the authors of those blogs don't foam roll every single day! First, I will address the type of rollers that are good vs. overpriced vs. ineffective. 1. Are vibrating foam rollers effective for recovery? No. The reason that vibrating foam rollers are not good for recovery is because the vibrating mechanism is a distraction & ineffective. There is no scientifically based or empirical data that suggests that vibrating rollers work. Furthermore, Amazon testimonials suggest that vibrating foam rollers are ineffective. It is a fact that "vibrating rollers are not effective at massaging the muscle tissue. All vibrating rollers are overpriced & over hyped. The unit itself is too dense for ordinary muscle tissue. Many of the vibrating rollers contain too many stiff components that affect the muscle tissue in a ergolytic way. A true foam roller consists of more foam or padding than plastic plus batteries. You always worry about the batteries and charge life vs thinking about more important ideas such as, "personal physical assessment." "Where is my muscle/tendon that feels sore and painful?" "Is my right side tighter than my left or are they equally as tight?" To be 100% honest, the vibrating roller vibration mechanism is just a little better than my vibrating Mach 3 face shaving razor. The idea & benefit that has been the essence of foam rolling isn't about external vibration whatsoever. It is about the internal or in-vivo repair and reordering of the muscles metabolism. Ditch the vibrating foam roller. 2. Should I purchase a High Density or Med Density Foam Roller? Both. This question comes up all the time. Why both? If you are asking about a medium density roller, that suggests that you may have "sensitive muscles" or you are just not ready for a high density variation. If I am really sore post workout, I prefer the medium density foam rollers. However, a high density roller will bust through stubborn myofascial adhesions with more force and precision than a medium density roller. So, the rule-of-thumb is, always have more than one roller & always have a medium or high density option for the days your roller is not hitting that sweet spot. 3. The knobbier the roller is and the harder the roller is the better!? False. Knobby foam rollers or "textured foam rollers" are not as effective as smooth round foam rollers. Imagine you are driving down a smooth road with a hot cup of coffee and you purposefully drove full speed ahead even though you noticed you were approaching a speed bump in the road. Wouldn't you prefer a smooth road vs. a bumpy road? Do you fly over speed bumps or do you approach them carefully? Our randomized surveys suggest everyone prefers a smooth foam rolling experience. Our conclusion is even more emphasized with those that suffer from musculoskeletal malformations & diseases such as MS, fibromyalgia, scoliosis and sciatica or a past injury. Skeletal muscle is packed full of nerves, vessels, capillaries, pressure receptors and also the cells themselves. If you were to consistently use a "textured roller" then you run the risk of damaging the underlying fibrous tissue and its matrix. Contusions are more common after using a textured foam roller vs a smooth round roller like the "Atlas Foam Roller" vs a knobby roller like the "Rumble Roller." Finally, there are benefits to using a "Textured foam roller." You must simple move slower & roll cautiously while utilizing "body twists" to break up stubborn muscle fascia tissue. 4. "Is a foam roller suitable for lower back pain?" Yes. Foam rollers are complementary for the size, morphology, density and direction of your overall muscle structure (musculoskeletal structure), especially for the lower back muscles that are hard to penetrate. Most lower back pain is associated with muscle tension and disjointedness. The handles on the Atlas Foam Roller allow you to control the amount of pressure you place on your lower back; you can either choose to lightly graze that area or dig in to the deep knots and tension in the dense muscle tissue. Throughout my own experience I have seen excellent results from daily foam rolling, including the lower spine or lumosacral area. Just like everyone else I see a chiropractor on occasion. At first I was a bit nervous that my chronic foam rolling sessions would or could possibly inflame or cause problems to my lower back. I was assessed by Dr. Ryan Bones for my neck [pain and my hips. After he assessed my spine he was excited not only that I was foam rolling in-between sessions but that my lower lubosacral area was very "springy" or had an excellent rebound tone to it. Essentially he advised me that foam rolling with the Atlas Foam Roller combined with stretching has helped my spine health. The elasticity was above average. 2. "What density foam should be selected to avoid over stressing the lower back area?" Surprisingly, the lower back can take on the high -> medium density foam without a problem. If you are experiencing pain you must assess what type of pain that you are experiencing. If the pain is a sharp stinging pain or a pain that radiates down the leg then I would suggest to go with the medium density foam. If your pain feels like a burning sensation, pulling sensation, pressure sensation or stretch sensation then the high density foam roller is well suited for you. I personally switch back and forth from the high density foam to the lower density foam depending on how my back feels that day. What I mean by that is I personally use or combine the high density Atlas Foam Roller along with the medium density Reinforced Foam Roller. I start with the medium density roller to "warm up my back" to loosen it up and then I switch to the high density Atlas Foam Roller to finish the self-myofascial release session. Sometimes I just lay on the center of the Atlas Foam Roller so that my lower back and hips can encompass and sink into the foam. That technique assists in muscle tension relaxation (golgi-tendon manipulation) and overall improvements in lumbosacral (low spine- hip) flexibility. 3. Some websites suggest to avoid foam rolling the lower back, is it okay to roll over lower spine area? Absolutely! When searching the world wide web information is everywhere. You can find good information and bad information. Unfortunately there are companies out there that post about "un-proven" or "unsubstantiated" evidence of low back concerns as it relates to foam rolling. I imagine they do this so they will be featured in Google at a high "keyword" rank so they can sell their product to you or anyone searching for "side-effects" or "health concerns" that plague individuals while foam rolling. Before you take a "supplement" or "drug" do you not look up side effects of the drug first?" The most important idea to keep in mind is that there is a proper way to foam roll the lower back and there are improper ways to foam roll the lower back. Since the Atlas Foam Roller has handles, you can control the distance at which your lower back sinks into the foam. You can also control the speed and distance you travel away from the foam as you roll from from upper back -> lower back. 4. Should I foam roll before or after a workout? I suggest you foam roll throughout your entire workout to keep those areas loose that stiffen up limiting your range of motion. 5. I have a chronic back pain problem from a slipped disk, is that a problem? Can I still foam roll? Ans: YES! Foam rolling is healthy for all chronic conditions related to back pain & "chronically inflammation in vertebral disks." Foam Rolling can take pressure off the area of concern. My Stretch Therapy Methods prove this statement. I had a client with chronic back pain. Though my methods an her willingness to push through the uncomfortable adhesion knots she left the session with a lot less pain & more flexibility than 2 years worth of therapy! 6. Which is better a smooth foam roller or a bumpy one? Throughout my journey to find the best foam rolling & back pain therapy equipment I now understand that textured foam rollers are not as effective as advertised. Textured foam rollers such as the “Rumble Roller” or the “Trigger Point Foam Roller & even the “ Morph collapsing foam roller ” do not meet the therapeutic grade claims they advertise to meet. 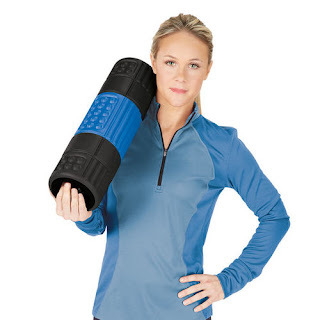 Instead it is unfortunately a marketing strategy to draw you in to purchase a foam roller that over promises its back pain or muscle pain destroying benefits. As I have observed, foam rolling with “bumps or ridges” actually disturbs muscle synchronous signalling thus it causes more problems than it relieves. However, it is all about preference. If you enjoy the bumpy foam rollers, then use them. It is always better to use a foam roller that is complementary to your uniqueness. 7. I Have Sciatica, can I foam roll? Which Roller(s) do you recommend? YES!! Check Out the video below. Approximately 90% of all sciatica inflammation will resolve in 2-4 weeks. If the pain is debilitating to the point where it affects your quality of life then surgery is a viable option. Surgery may be required if complications occur such as bowel or bladder problems. Many treatments, including steroids, gabapentin and most of the western medical methods have poor evidence of effectiveness. CBD and combination of CBD, Bromelain, KAVA and other natural anti inflammatory treatments. Combo of everything listed along with spinal twists. 8. I have scoliosis, can I foam roll with any type of foam roller? Is there risk? Throughout my experience teaching people to foam roll effectively, I have witnessed zero acute or chronic injuries as a result of foam rolling too much even when a scoliosis phenotype is present. So, foam roll away! 9. Does foam rolling build up scar tissue? 10. I just had a chiropratic adjustment, can I foam roll afterwards? 11. Can I injure myself foam rolling?